In the above image Quasar KUV18217+6419 round spectral order zero is in the upper left corner and it's first order blazed grating emission spectrum is on the top to the right side. The processed spectrum band is below the blazed grating spectrum. The average of the Quasar KUV18217+6419 measured H-alpha, O[III], H-beta and H-gamma emission lines redshifts is z= 0.29615 which is 0.29% lower than the NASA-IPAC Extragalactic Database value of 0.297000. Age of the solar system is 4.5 Gyr. Age of the universe is 13.292 Gyr based on Ho= 73.0; Ωmatter = 0.27; Ωvacuum = 0.73. KUV18217+6419 image was taken with a 150mm (6 inches) telescope and a Rainbow Optics Visual, Photo and CCD Star Spectroscope diffraction grating filter. 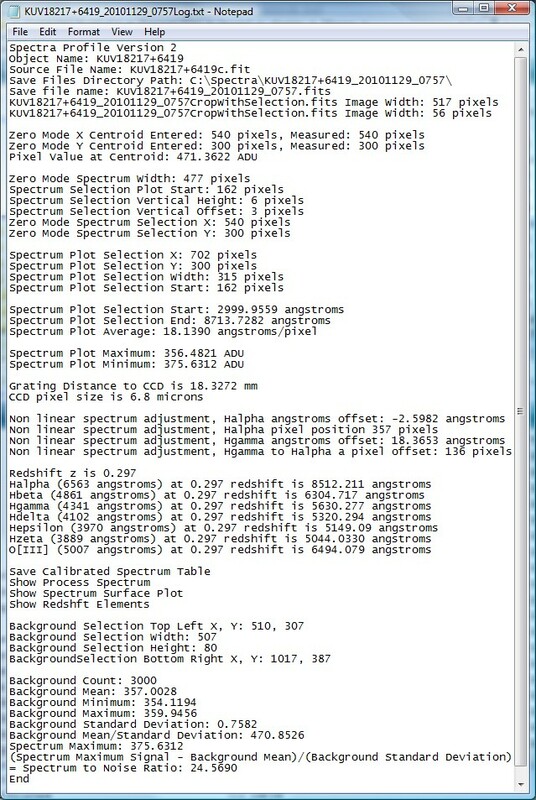 The spectrum analysis was done by ImageJ Spectra_Profile_QSO_V2.txt macro. In the center of the above animation image is Quasar KUV18217+6419. KUV18217+6419 cross-identification is [HB89] 1821+643. Just above Quasar KUV18217+6419 zero mode image is the lumpy spectrum of a variable red star variable star IY Dra with spectral type M8.5 D ~. The Rainbow Optics diffraction grating filter is blazed for the first order on the right of the zero order image. Look at the two brighest stars to see their bright first order spectrum on the right side. Next, look at the left side of these bright stars for their fainter unblazed first order. The spectrum closest to the zero order image is the short wavelength of the spectrum. The spectrum farther away from the zero order image is the longer wavelength of the spectrum. The Quasar and the stars are larger in this image than the image with no filters because the focus was adjusted for the longer wavelength part of the spectrum where the redshift of the H-beta (Balmer Series) emission line is located. As a result, the spectrum becomes wider (more out of focus) at the shorter wavelengths and the spectrum is narrower (more in focus) at the longer wavelengths. The focal plane with the diffraction grating filter is curved and decision needs to be made as to which part of the spectrum will be in the focus. The spectrum band is added to the image to help identify the KUV18217+6419 spectrum. The purpose of this image is to check for faint field stars that would interfere with the spectrum. There is one faint field star in the far right of the KUV18217+6419 spectrum. Therefore, the processed spectrum does not extend into the longer wavelength because it would include the faint field star (USNO-A 1500-06485298 Red Magnitude: 18.20 located in the center of the red circle in the SkyCharts below.). The brighter star above USNO-A 1500-06485298 is HST GSC4222.1935 Magnitude: 13.60+/-0.39. The camera image was rotated so the the field star directly west of KUV18217+6419 would not be in the KUV18217+6419 spectrum image. The Quasar and stars are smaller in this image because the focal plane is flatter without the diffraction grating filter. SkyCharts - Cartes du Ciel 2.76c with HST GSC and USNO-A star cataloges. The above cropped image is the selection area for the KUV18217+6419 spectrum that was used for analysis. It is six rows by 315 columns. Short wavelengths are on the left and the long wavelengths are on the right. The spectrum is redshift to the longer wavelengths. The far right spectrum bright area at the right selection edge is H-alpha emission. The two bright spectrum areas close to each other and to the right of the center of the selection area is H-beta emission on the left and O[III] emission on the right. The bright spectrum area to the left of the center of the selection areas is H-gamma emission. The bright star in the upper right corner is the spectrum zero mode image of HST GSC4222.1935 Magnitude: 13.60+/-0.39. Below HST GSC4222.1935 is the very faint star USNO-A 1500-06485298 Red Magnitude: 18.20 that is in the very faint Quasar KUV18217+6419 long wave length spectrum. Spectrum selection area is six rows by 315 columns and it was optimized for the H-alpha part of the spectrum. The black pixel in the KUV18217+6419 zero mode image is the centroid of KUV18217+6419. This selection shows the grating filter is not exactly horizontal and it is rotated clock wise by 2 to 3 pixels at the H-alpha wavelength. The ImageJ macro has a vertical offset from the Quasar centroid to compensate for this small rotation. The 3-D Surface Plot uses this selection below. 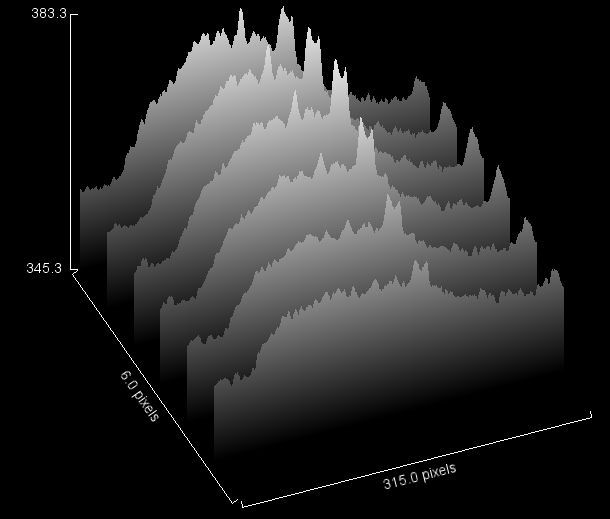 This is a 3-D surface plot of the selection area of six rows by 315 columns. The short wavelengths are on the left and the long wavelengths are on the right. The far right spectrum peak at the right edge is H-alpha emission. The double spectrum peaks is H-beta emission on the left peak and O[III] emission on the right peak. The center narrow spectrum peak is H-gamma emission which is best seen in the back spectrum row. The average of the six rows is used to generate the spectrum band and chart below. The average of the six vertical pixels in the selection area is used to generate this spectrum band at three times the original horizontal size of 315 columns so that is matches the below spectrum chart width of 945. Short wavelengths are on the left and long wavelengths are on the right. The spectrum is linearly scaled between the intensity 20 to 230 to better see the spectrum details. No sharpening or other image processing was done on the spectrum band. The above chart is the average of the six vertical pixels in the selection area of the KUV18217+6419 spectrum with redshift emission line markers. The star Vega H-alpha absorption line was used to calibrate the x axis in angstroms by measuring the distance of the grating to CCD. Images of Vega spectrum were taken before imaging KUV18217+6419. Vega H-alpha absorption line distance was measured from the centroid of the spectral order zero. The below table shows the four images used and the calculated grating distance between the grating and the CCD. The grating distance mean is 18.3272 mm with a standard deviation of 0.01414 mm. � is light wavelength measured in angstroms. 0.0000068 m is QSI532ws pixel size (6.8 microns). Pixel distance is the horizontal pixel distance from the centroid of spectral order zero. .01832719265135 is the distance of the grating to CCD (18.3272 mm). 0.000005 m is the distance between the Rainbow Optics grating filter lines (200 lines/mm grating). 10000000000 converts the wavelength from meters to angstroms. The vertical axis is the intensity values (average of the six vertical pixels) of the spectrum image. Four emission reference line markers were added to show the calculated redshift (NED z=0.297000) of the elements in the tables below. The KUV18217+6419 observed H-alpha is at 8509 � which is above the normal human vision range of 3800 � to 7400 �. It is very impressive that the QSI532ws CCD camera successfully captured the H-alpha at 8509 �. The following measurements of the above yellow selection box are found at the bottom of the spectrum log below. The calibrated spectrum data starts at the Quasar KUV18217+6419 centroid. The spectrum chart starts with pixel 162 at 3023.6903 � and goes to pixel 476 at 8677.3457 �. The calibrated measured spectrum data emission lines are used in the analysis tables below. The calculated redshift emission line markers in the above KUV18217+6419 spectrum chart are based on the Emission Lines Redshift Analysis Table below. Emit wavelength is the wavelength measured at the source which is laboratory reference data for the emission lines. Calculated wavelength change is the redshift (NED data z=0.297000) times the emit wavelength (laboratory reference data). Calculated wavelength is the calculated wavelength change plus the emit wavelength (laboratory reference data). Measured emission wavelengths are from the spectrum chart and log pixel angstroms intensity table. The average of the measured H-alpha, O[III], H-beta and H-gamma redshifts is z=0.29615 which is 0.29%: lower than z=0.297000 in the NASA-IPAC Extragalactic database. The following analysis uses KUV18217+6419 redshift (z=0.29615). Press the general button as shown below in the screen capture with the calculated data. 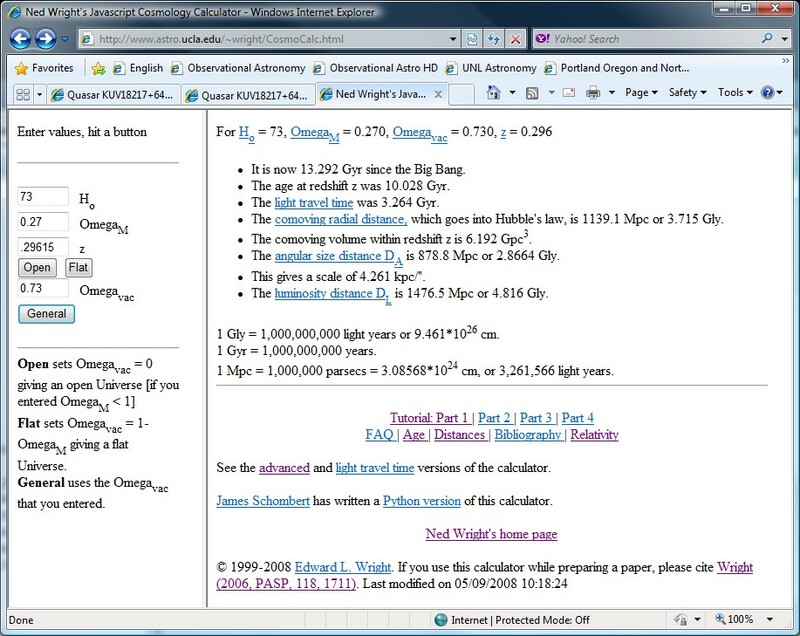 Ned Wright's has an excellent tutorial at the bottom of the Cosmology Calculator. The following test pattern is to help you adjust your monitor to best view the CCD astro images. The test pattern is used for adjusting monitor brightness, and contrast. Adjust monitor brightness and contrast to see all 16 gray scale levels. The most important adjustment when viewing astro images is to see the differences in all of the black bands.